Even if there are several spots around Rome where Muslims gather to pray (usually apartments or garages arranged for the purpose), this is the only Islamic temple in Rome and the largest Mosque in Europe as well. 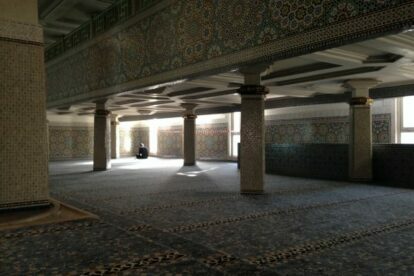 The Great Mosque of Rome is equally beautiful both in its interiors and exteriors. It was designed by the Iraqi architect Sami Mousawi and the Italian architect Paolo Portoghesi: an architectural project which is itself a meeting point of not only two different religions but of two different architectonic cultures as well! And the resulting architecture is something that I like a lot: it is made of repetitious designs and amazing geometric patterns, with the ubiquitous palm-shaped columns representing the connection between Allah and the single devotee (which -as I learned during the visit- is a very individual relationship, without all the intermediaries of the Catholic religion). I found that the several tricks of light, such as the different temperature of light between the two main sections of the Mosque, create a meditative and fascinating atmosphere. And I loved the interiors, which are decorated with simple yet beautiful mosaics creating more optical effects, while the floor is covered by an extremely soft Persian carpet with geometrical patterns as well. The Mosque is open for visits on Wednesday and Saturday mornings, but if you go there on Friday mornings you can experience the great Arabic food market that is held outside the Mosque, with all its spices, dried fruit and delicious sweet snacks.